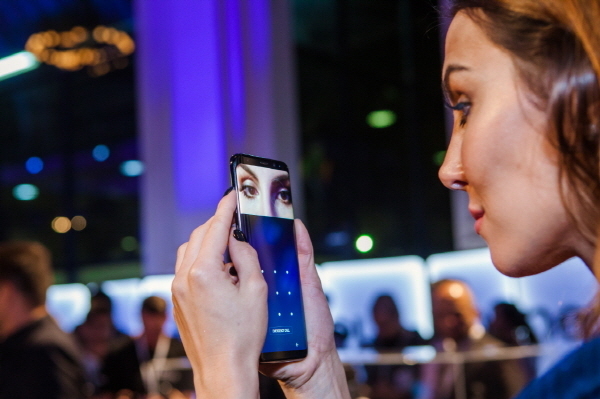 Samsung Electronics said Thursday that it is not easy to fool the Galaxy S8’s iris recognition, hitting back at a claim by a group of German hackers who said they had cracked the phone’s iris scanner. Samsung’s explanation came after a German hacking collective, Chaos Computer Club, posted Tuesday a video on YouTube showing that it could break the Galaxy S8’s iris recognition lock with a printer, a picture of an iris photo taken with a camera and contact lenses. In the video clip, members of the collective take a photo of the phone owner’s eye with the camera that can capture infrared light and print it out with a Samsung leisure printer. They then placed contact lenses on top of the picture to mimic the curvature of the eye. “If you value the data on your phone -- and possibly want to even use it for payment -- using the traditional pin protection is a safer approach than using body features for authentication,” he said. CCC, a long-running hacker collective formed in Berlin in 1981, is the same group that fooled the fingerprint sensor of Apple’s iPhone 5S, just two days after the device went on sale worldwide. The hacking team had taken the fingerprint of an iPhone user, printed it onto a transparent sheet and created a fake fingerprint to unlock the phone.